The volume of a building is probably the first characteristic what meets the eye of an observer. Le Corbusier (in his ‘Vers une architecture’, 1923) becomes lyrical when he points to the primary forms of cubes, cones, spheres, cylinders and pyramids as eye-catchers in the game of light and shades. He called them ‘de belles formes, les plus belles formes’ (beautiful forms and most beautiful forms). The language of forms is transmitted in volume and becomes a statement of intent. The basic dedication of the Egyptian, Greek and Roman architecture, said Le Corbusier, is written in their prisms, cubes, cylinders and spheres: the Pyramids, the temple in Luxor, the Parthenon, the Colosseum and the Villa Hadrian. That is, as he saw it, real architecture. And he was not tired to extent the list with the Tower of Babylon, the Gates of Samarkand, the Pont du Gard, St Sophia and the mosques of Istanbul, the Tower of Pisa, the copulas of Brunelleschi and Michelangelo, the Pont Royal and Les Invalides. Le Corbusier was less enthusiastic about the Gothic architecture with their ogives and complex geometry. The cathedral offers a forced solution to a structural problem, but it does not relate to the primary forms. Therefore, one has to resort to a subjective order to understand the building: the cathedral is not a plastic work, but a drama, calling for the sentiments. It is clear from his writings that Le Corbusier was not interested in those sentiments. The spirit of the time – his ideas were conceived under the dark clouds of First World War – pointed to a rejection of drama. This repudiation included the religious beliefs at the root of the sentiments, which led to the building of the cathedrals in the twelfth and thirteenth century in the first place. Le Corbusier was much more in favor of the engineers, who designed the bulky grain silos on the fertile plains of America and Canada, those ‘magnificent buildings of the modern times’. The (structural) engineers used the primary principles (of form, function and volume) in an effective way, simply based on calculations. The new architect had to be an engineer. Please, no sentiments. 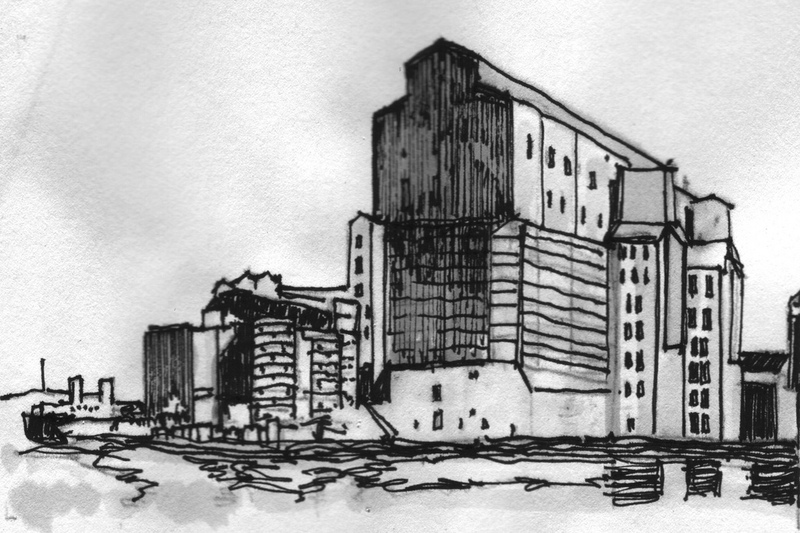 The grain silos of the Mid West are the consequent examples of a modern architectural beauty. They represent, without doubt, the esthetics of the engineer (fig. 798). The relation with quadralectic thinking might not immediately be obvious in the cheering of the beauty of grain silos and some further explanation is needed. Fig. 798 – American grain silos as a specimen of modern architecture, according to Le Corbusier in the 1920’s. He envisaged a new form of architecture based on calculations done by engineers (drawings by Marten Kuilman after photo’s in Le Corbusier’s book ‘Vers une architecture’ (1923). Building in the twentieth century has been greatly influenced by the ideas of a functional architecture. It became possible with the use of reinforced concrete and other advanced building techniques. The kernel of Le Corbusier’s ideas is, up to the present day, still ‘up-to-date’, although the conception took place nearly a century ago. What does this state of affairs tell us about the modern architecture in the beginning of the twenty-first century? What does contemporary building tell us about the mind of their builders, from conception to final product? The valuation of modern architecture is a matter of position, from both the building in place and time and the observer in his or her own cycle of place and time. If those circles meet – and they do the very moment a valuation takes place – than it is a matter of understanding the positions in a clearly defined type of division thinking. A judgment in a dualistic environment is different, or at least much more limited, then an evaluation in a higher (four)-division setting. A methodical analysis of the type of division thinking is therefore a conditio sine qua none for any (e)valuation of an architectural achievement. 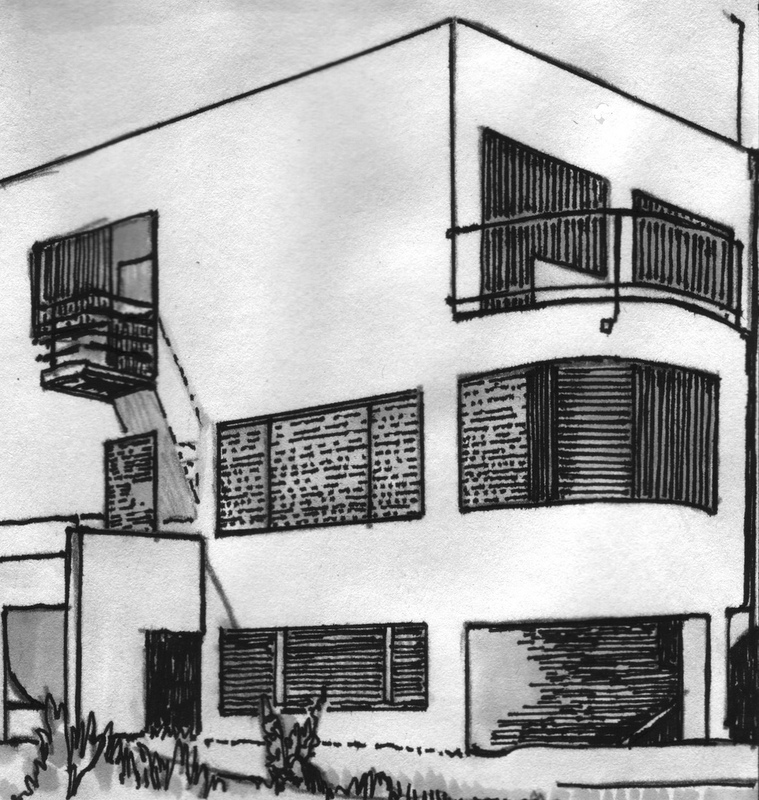 What type of division thinking did Le Corbusier use? What was the position of this influential architect at the beginning of the twentieth century in the European cultural period? The answer to this question is vital for the appreciation of his work. There are four elements to deal with: the European cultural history in a particular stage of development, an architect and his (Le Corbusier’s) development, the position of an observer in the European cultural history and the place in the life cycle of the observer. Clearly, these different units have a close relationship with each other. The development of the European (cultural) history is a ‘subjective’ matter, which must be agreed upon in a scientific way. The (division) model, in which the research takes place, is of crucial importance for its outcome. A lower division model (with a linear time scale) might provide easier answers, but can provoke the intellectual depth of the problems. A higher division model (with a cyclic time scale) increases the influence of the subjective observer by bringing in the invisible qualities of intuition and feelings. An architect (like Le Corbusier) has – in hindsight – his own place in the European history, but he also had his own development from an ambitious young man to a recognized celebrity. It can be assumed that he went through various stages and points of view. ‘The work of Le Corbusier’ – as a statement – is a gross generalization, because there are certain variable outlooks and intentions during his life. To look for a specific, unaltered type of division thinking during the whole time span of the architect’s life is a simplification. It is more likely – at least from a quadralectic point of view – that Le Corbusier passed through the various quadrants of his life, each with its own predominant type of division-thinking. An observer determines the division context on which the judgment hinges. The ‘objective’ type of division thinking is, in a historical context, often dominant. An observer living in, say, the Renaissance (i.e. around the pivotal point of the European cultural history, 1500 AD) was unable to reach higher than the Third Quadrant context in which his time frame was situated (that of oppositional thinking). Any effort to reach higher leads to numerological constructions. Modern descriptions often classify these efforts with the term ‘Neo-platonic’. A contemporary observer, on the other hand, living in the Fourth Quadrant of the European cultural history (which started in 1800 AD), should be able to understand the four-fold way of thinking to its full depth (if ones own development allows such a view). Finally, this observer goes through its own visibility cycle. A valuation and/or evaluation of any communication depends on the position of the observer in the life cycle (i.e. the period of visible visibility (X) within a communication cycle, see fig. 852). The movement through the quadrants provides an ever-changing view, starting with the preliminary ideas of the Second Quadrant, the security of a temporary identity in the Third Quadrant and the acknowledged subjectivity of the Fourth Quadrant. At which stage in this development does a judgment take place? Only a moment of self- and soul-searching can give a (temporary) answer. This point of awareness, in all its ‘subjectivity’, is of the greatest importance in the valuation of the initial question. Le Corbusier did not like the sentiments of the Gothic, but he knew that those sentiments existed. His adoration of the large scale, massiveness and multiplicity is – for better or worse – an indication that the Fourth Quadrant was present in his thinking. The importance of volume is, in essence, a Second Quadrant quality (as the invisible visibility of an idea), but can shift to the Fourth Quadrant if the ideas materialized (as the visible visibility of the material). It was noted earlier that Space could be positioned as a First Quadrant item, because of its basic properties (and its invisible invisibility). Volume also possesses these qualities, but in a more condensed sense and after a division decision took place. Volume is the representation of Space in the Second Quadrant. Volume in itself is nothing and everything, because it is initially an unspecified unity in space. Volume only becomes real when it is caught in one form or another (the sphere, cube or cylinder). A sphere has volume, but is not volume. To understand the character of Volume, one has to understand the nature of its position within the communication. The basic forms of prisms, cubes, cylinders and spheres are the representations of divisions in space, ‘chosen’ in a Second Quadrant environment. Firstly, there is the realization – but no visualization – of volume (in space) in the first part of the Second Quadrant (II, 1). Subsequently, the idea of volume – and visibility – is further developed in the second part of the Second Quadrant (II, 2). The forms come into visual being after delimitation took place in the third part of the Second Quadrant (II, 3). Finally, the endless manifestations of volume are encountered in the fourth part of the Second Quadrant (II, 4). This classical conceptual sequence (in a cyclic quadralectic environment) can be illustrated as follows (fig. 799). Fig. 799 – The position of Volume is given here within the context of a Second Quadrant environment. The first choice (of a division) takes place on the boundary between the First and Second Quadrant. This selection is essential to the understanding of Volume in the rest of the communication. The second choice is a repetition of the first option on a second level. 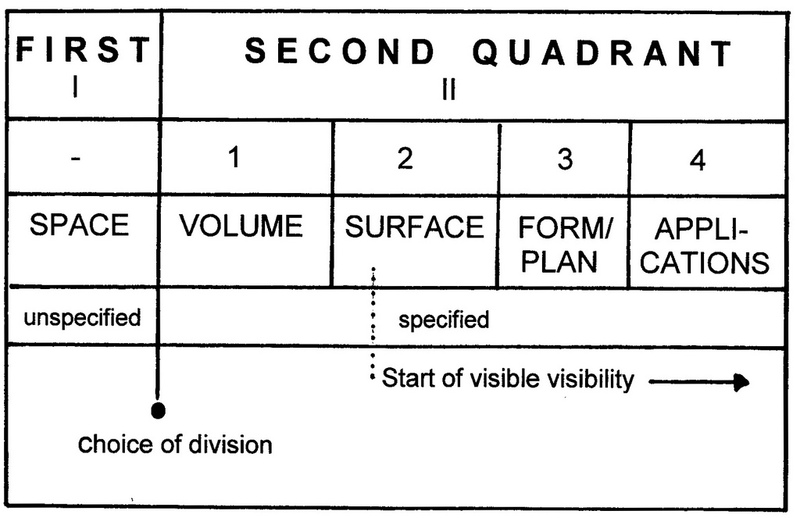 It takes place between the first and second part of the Second Quadrant and opens the area of visible visibility. The four-fold character of Volume (as a ‘Platonic’ Idea) must be kept in mind when any statement about the volume of a (real) building is made. Magnitude, in it-self, is a specification of Space. It points to a further investigation of Infinity. The direction is in a cyclic environment either back-wards to the First Quadrant, or forwards to the Third and Fourth Quadrant. However, before such steps are taken, there are still three more steps in the (subdivision of the) Second Quadrant (II, 2 – 4). The interest in ‘Volume’ as an aesthetic entity came alive in the early twentieth century in a style called Cubism. In particular the painters Pablo Picasso and George Braque ventured in this artistic terrain. The early form of Cubism (1906 – 1908), also known as ‘Analytical Cubism’ – took the square forms of crossing lines and ‘embodied’ them. The outlines of an object were broken up, analyzed and reassembled in an abstract form. This analytical approach changed to ‘Synthetic Cubism’ developed by Picasso, Braque, Juan Gris and others between 1912 and 1919. It coincides with ‘High Cubism’ (1909 – 1914). Subsequently, the Late Cubism (1914 – 1921) advanced in an avant-garde movement (COOPER, 1970). The town hall of Hilversum (Nederland) was designed by the Dutch architect Willem Dudok (1884 – 1974) in 1924 and built between 1928-32. 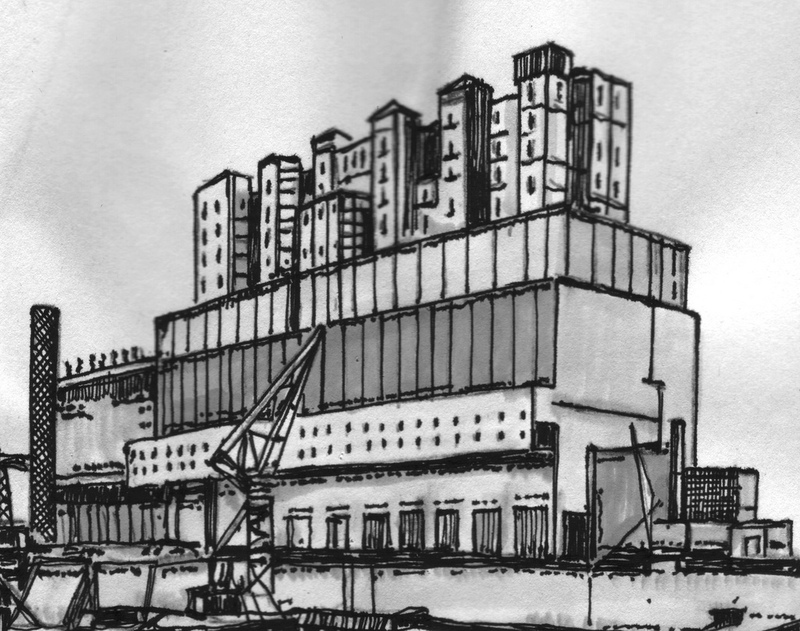 The uncompromising, cubistic building consisted of well-proportioned square elements (fig. 800). Dudok started after graduating from the Royal Military Academy in Breda as an engineer constructing defensive forts and military buildings. He became City Architect for Hilversum in 1927 and was in command of the town expansion. Frank Lloyd Wright and the Chicago Prairie School were mentioned as his sources of inspiration. Dudok stated that ‘monumentality is the most pure expression of the human sense of harmony and order’. Fig. 800 – The town hall of Hilversum (The Netherlands) was designed by Willem Dudok in 1924 and built from 1929 – 1932. He used yellow bricks in a well-proportioned, volumetrical way. The emphasis is on horizontal and vertical lines, and no curves are present. The ground plan is a square with an inner court of approximately twenty-two meters. The Hungarian painter and architect Farkas Molnar (1897 – 1945) was a leading member of the Modern Movement and had ties with the Bauhaus. He designed houses with a strong emphasis on volume and its visibility. The circular line was introduced to soften the edges, like the Villa Dálnoki-Kováts in Budapest (fig. 801). Similar creative innovations could be noticed in Russia, for instance in the Palace of the Press and the Mass kitchen in Baku (1930 – 1931). Fig. 801 – The Villa Dálnoki-Kováts in Budapest XII by the Hungarian painter, architect and activist Farkas Molnar was built in 1932. The importance of volume in the design of a building reached a new stage with the introduction of the circular added to the square volume. The concept of boxes and circles was extended to new neighborhoods in Britain by the architect Stephen Rowland Pierce (1896 – 1966). He had made his mark in the design of the town halls in Norwich, Norfolk and Hammersmith (London). 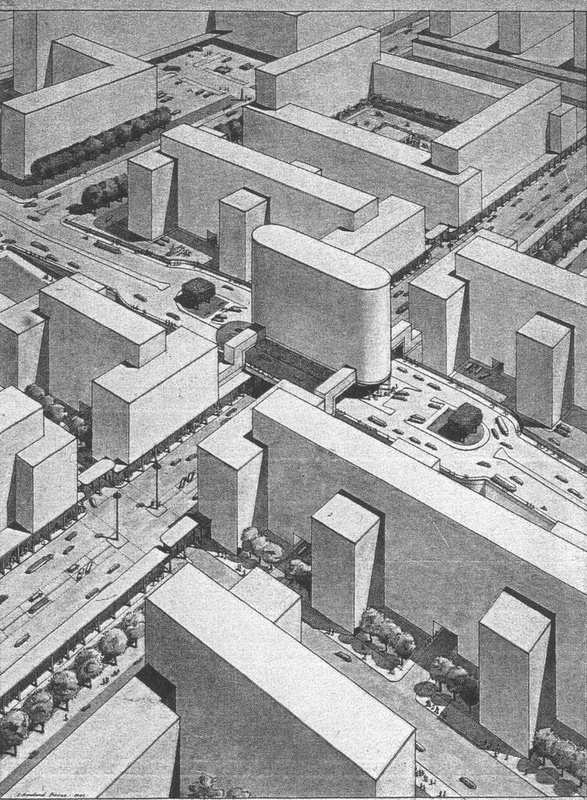 His ‘Design for a post-war reconstruction of the Metropolis of Britain’ (1942) used the cubic (and round) concept for the lay-out of a whole new city (fig. 802). Fig. 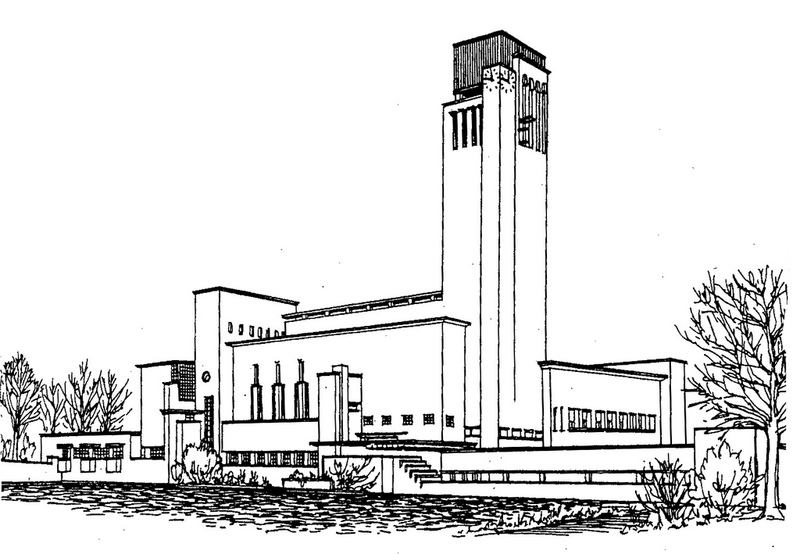 802 – A design for postwar reconstruction of the ‘Metropolis of Britain’ by the architect Stephen Rowland Pierce (1896 – 1966) as conceived in the year 1942. The importance of volume surpassed the artistic style of Cubism in the twentieth century. The idea of three-dimensionality grew into an architectonic mission of its own. The Bauhaus found its inspiration in the treatment of space along the lines set out by Cubism. The Americans, who had experimented in the use of volume in their own way, came to the same conclusion: every building should have its dimensions in space to stake its identity. 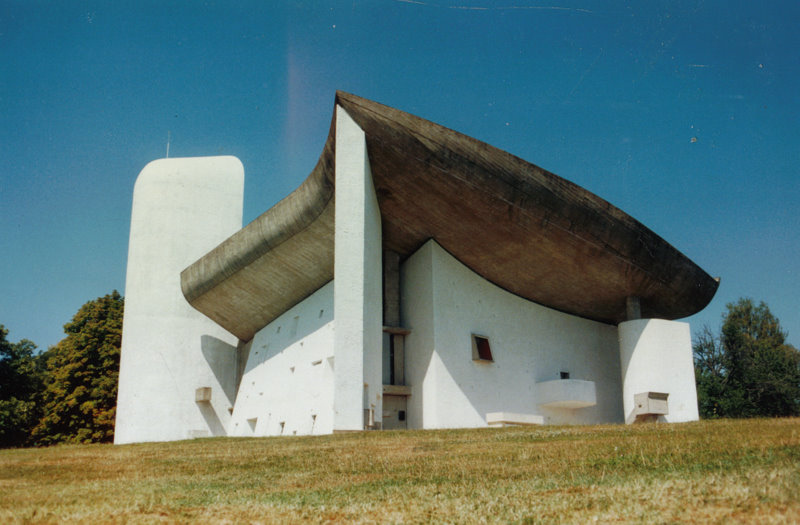 Le Corbusier achieved in his Church of Notre Dame du Haut (Ronchamp, France) further revolutionary advances in building with reinforced concrete (fig. 803). The church was built in 1955 and became an icon of 20th century architecture. Fig. 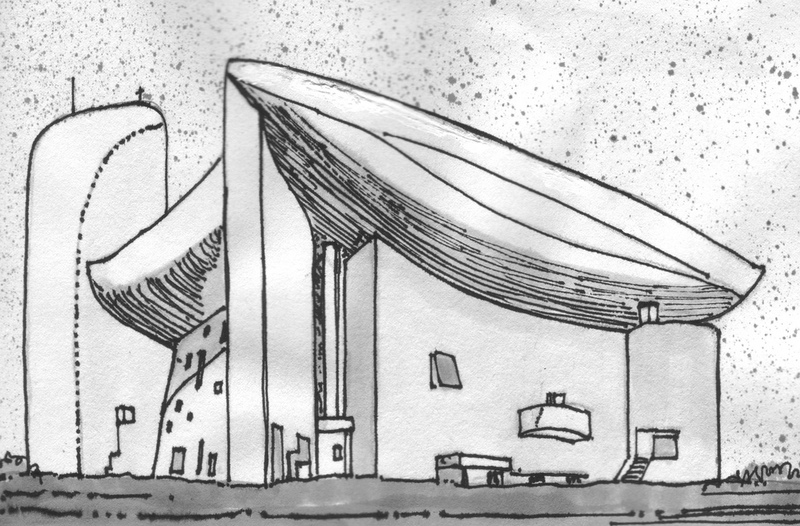 803 – A drawing of the Chapel of Nôtre Dame du Haut at Ronchamp (France-Comté, France) displays the massive, curved concrete walls and the irregular windows. Chapel of Nôtre Dame du Haut at Ronchamp by Le Corbusier. Photo: Marten Kuilman (1991). The style is qualified as expressionist modern, pointing to an activation of ‘feelings’ in the creative process. These emotional elements are recognized in the Fourth Quadrant of a quadralectic communication. However, no direct reference to the four-fold is present. Curved lines are dominant. The oblong nave, two side entrances, an axial main altar and three chapels beneath towers have no tetradic referrals. The light through the small windows plays its own surrealistic game. All these characteristics are enigmatic in relation to division-thinking, but that might be the very strength of its design. In the same geographical area as Ronchamp (around Basel) is another impressive concrete building known as the Goetheanium. This building was the brain child of Rudolf Steiner (1861 – 1925). He was a charismatic Goethe scholar and philosopher with an interest in the occult. His study of aesthetics, combined with a knowledge of mathematics and history sparked ideas over architecture, which were caught in the first Goetheanum in 1913. This wooden building, situated in Dornach (Switzerland), burned down on New Year’s Eve 1922-1923. 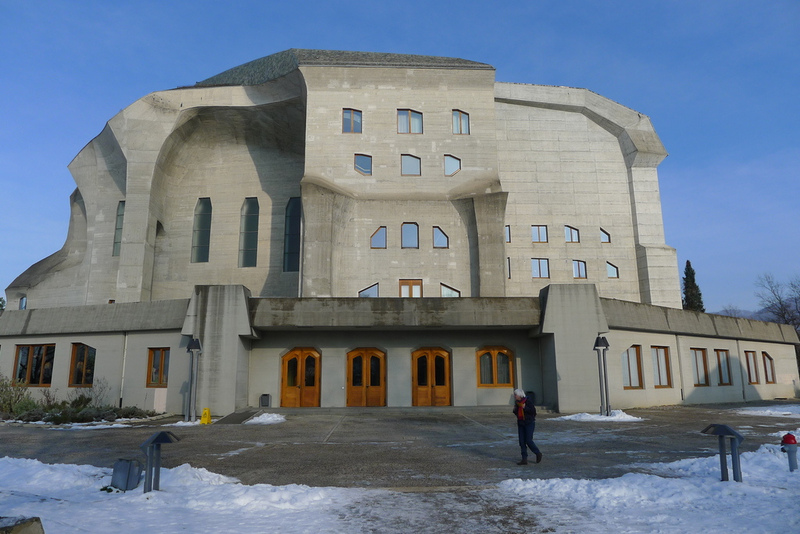 The new Goetheanum, now in concrete, was finished in 1928, just three years after Steiner’s death. The building acts as ‘a free high school for spiritual science’. 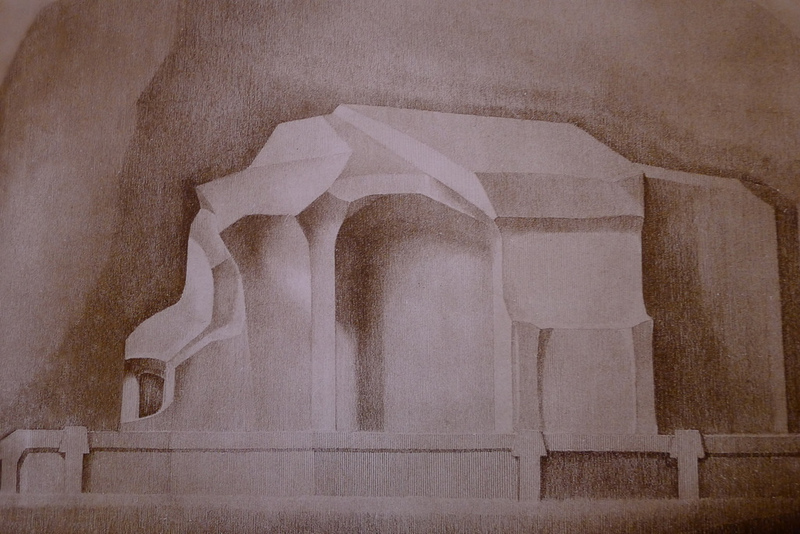 Sketch of the new Goetheanum. Rudolf Steiner’s book on ‘Die Rätsel der Philosophie’ (1914/1968) gives an overview of his historical thinking. He distinguished four periods in the development of the philosophy. 4. Further development of thoughts (‘Selbsterzeugnis der Seele’). These different types of philosophical thinking can be recognized, in Steiner’s view, in the European cultural history as the periods: 600 BC – 1 AD (1), 1 AD – 877 AD (2), 877 – 1500 (3) and 1500 – 2300 (4). The Goetheanum buildings are characterized by a metamorphosis of form, which is common in nature itself (as observed by Goethe). This natural change is difficult to envisage in solid architecture. The solution to mimic this process in a visual experience was found in the adding up of smaller, unrelated parts of a building to a new, harmonious whole ‘image’ (SHARP, 1966; ZIMMER, 1971/1985). This approach is the hallmark of an Expressionist style of the first decennia of the twentieth century. This phase of the Modern Movement in architecture was rich in fantasy, Utopian idealism and vision. The influence of the soul and its feelings is rated highly. The function of empathy (‘der liebevollen Hingabe an das von der Seele Erlebte’) has a resemblance to the important ‘Point of Recognition’ (POR) in the quadralectic philosophy. The latter is an active contribution of the observer to the process of observation, which determines the position in a cyclic communication. Fig. 804 – The sculptural shape of the (second) Goetheanum in Dornach (Switzerland) was (re)built to Rudolf Steiner’s original suggestions and executed in concrete. The first Goetheaum burned done in New Year’s Eve 1922/23. Photo: Marten Kuilman (2013). 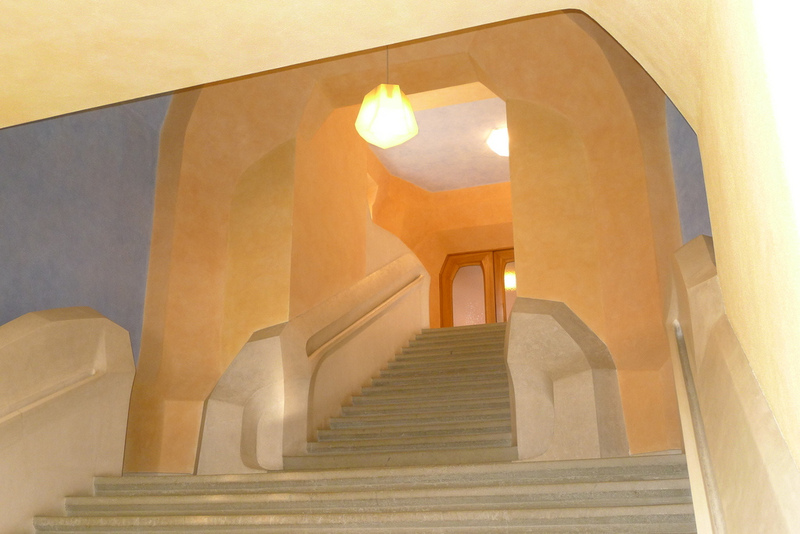 Entrance stairs of the Goetheanum in Dornach. Photo: Marten Kuilman (2013). Rudolf Steiner’s ideas and his movement of Anthroposophy (meaning the wisdom of mankind) have references to ‘Fourth Quadrant’ thinking. Steiner tried to create an order in which man and the world are related by a perception of rhythms of time. ‘These rhythms would extend from the heart beat of man to the eons of great cosmic epochs’ (A. Kenneth Bayes in a lecture to commemorate the Rudolf Steiner Centenary on 8 March 1961).